SHARPIE-Sharpie Permanent Marker: Fine Tip. Need we say more? 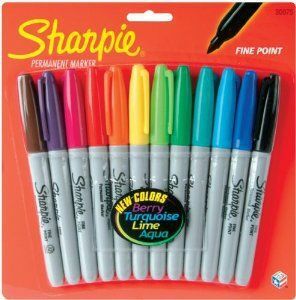 Sharpies have been one of the most popular permanent markers ever made. This twelve pack includes a wonderful rainbow of colors: black; royal blue; sky blue; green jade; lime green; yellow; orange; red; magenta; purple and brown. Conforms to ASTM D4236. Made in USA.